This page about the 1904 Vintage pattern, by 1847 Roger Bros., is adapted from an article which originally appeared in Antique Week. The Vintage pattern of silver-plated flatware was introduced by International Silver Co. in 1904 and continuously produced until about 1918, with new pieces being added to the line from time to time. This pattern has remained very popular with collectors in the years since then. The Vintage design features grapes (a popular design element since the ancient Greeks), while the great variety of pieces made gives collectors plenty to look for.. How many pieces were made in this pattern? The usual answer is “over 100,” but the actual number is very difficult to establish. 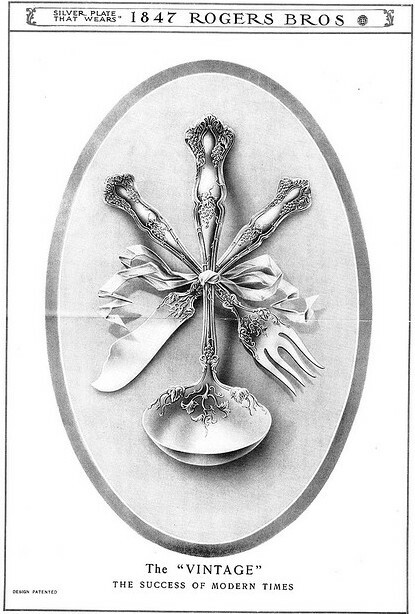 The early 1900s saw the introduction of a number of grape patterns in American silver plate. The four that collectors most frequently seek are: Vintage, introduced in 1904 by International Silver, 1847 Rogers Bros. mark; Moselle, 1906, American Silver Co., World Brand mark; La Vigne, 1908, Oneida, 1881 Rogers mark; and La Concorde, 1910, Oneida, Wm. A Rogers mark. Among the grape patterns, Vintage is easily recognized by the overall shape of the handle -somewhat like a violin. (V is for violin and V is for Vintage, if you need an aid for your memory.) La Vigne and La Concorde, on the other hand, have handle shapes in which the end of the handle forms a gentle gothic arch. The grapes are clustered differently in those two patterns, but the overall handle shapes are very similar. International sold Vintage under its 1847 Rogers Bros. mark, the mark it used for its highest quality flatware. Organized a few years before, in 1898, International Silver was formed by the merger of many smaller Connecticut companies, including Meriden Britannia Co., Rogers & Bros., and Wm. Rogers Manufacturing Co. International was able to use the 1847 Rogers Bros. mark because this mark had been the property of Meriden Britannia. The 1847 Rogers Bros. mark had been used by Meriden Britannia from the time of its formation in 1862. 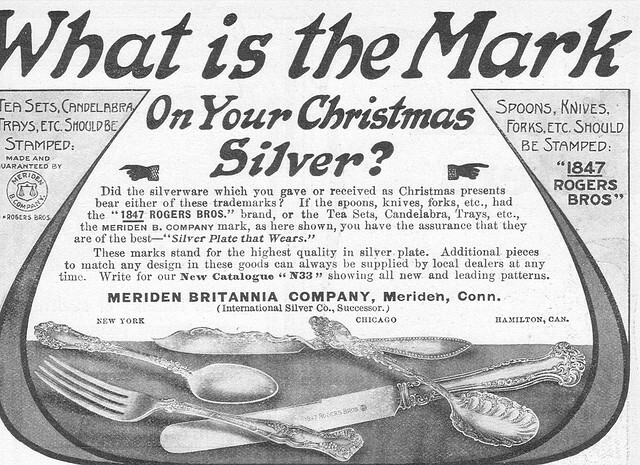 Meriden Britannia acquired the right to it from the original Rogers brothers, who started America’s first successful silver-plating operation in Hartford, Conn., in 1847. The 1847 Rogers Bros. mark was usually accompanied by a Meriden Britannia imprint within a tiny circle. This imprint continued to be used even after Meriden Britannia was absorbed by International Silver. The Vintage pattern design, for which International received a design patent on Aug. 2, 1904, shows the complex look we have come to call “Victorian,” along with a realism of detail which was very much in the taste of the times. Grapes are clustered at three locations on the handle: two clusters at the end, one cluster in the center, and an additional cluster just above the bowl of the piece. The grape clusters include carefully modeled leaves and tendrils. Many serving pieces, as well as some of the place pieces, display additional clusters of grapes, leaves and tendrils in the bowls of spoons or on the blades of knives and servers. Although I am not a Vintage collector, I am very interested in documenting old silver-plate patterns. Recently I decided to test the proposition that at least 100 different pieces were made in Vintage by documenting all the pieces made. At present, I can document 77 pieces, or 96 pieces or 110 pieces, depending on how the pieces are counted. Pieces can be counted according to function, that is, what they were used for. If the three variations of a dinner fork, for example, equal one piece, I can document 77 pieces. Pieces can be counted in accordance with variations in form, for example, a solid-handle dinner knife and a hollow-handle dinner knife are different pieces. If I include only those variations I have seen or can find illustrated in reference material, I can document 97 pieces. If I count the same way, but also include pieces other people may have seen, I can document 110 pieces. I have developed a list of all the flatware pieces in Vintage for which I can find evidence by purpose. For simplicity, I have standardized names of the pieces. Names vary greatly in different sources. In fact, International did not always call the same piece by the same name. When the same piece form had two clearly different functions, however, it is listed for each function. 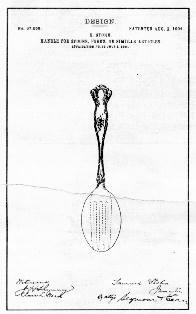 For example, the 5 O’clock Teaspoon, the Youth Spoon and the Egg Spoon were separately illustrated in catalogs and clearly have different functions, but their forms appear to be identical. Additional remarks about the nature of flatware pieces follow below. Some pieces — like knives — were made in both a solid-handle style and a hollow-handle style. When the handle is solid, the entire flatware piece is made from one piece of metal. When the handle is hollow, the piece is composed of a handle and an insert – the fork tines or the knife blade. Generally a hollow-handle piece is longer overall than a solid-handle piece. Sometimes two pieces with the same shape, function and handle style have other variations in size or design. For example, bouillon spoons were made in two lengths, hollow-handle bread knives were offered in more than one blade style and salad forks display more than one tine design. Collectors should also note that many serving pieces, like berry spoons and cold meat forks, were offered by International with an optional gold wash in the bowl. Such a gold wash protected the silver from the chemical effects of foods like vinegar and salt, as well as giving the piece a richer look. Some mysteries remain. My best research tool has been a privately printed book, Collectors Handbook for Grape Nuts, by Suzie MacLachlan (1971). MacLachlan photographed every piece of Vintage she could find, reported the length of the pieces and showed catalog excerpts for some pieces she could not locate. When I have not been able to measure a piece myself, I have used her measurements. MacLachlan also mentions additional pieces which other dealers and collectors told her they had seen. A few of these missing pieces turned up in Vintage catalog pages shown in The Elegance of Old Silverplate and Some Personalities by Edmund R Hogan (Schiffer Publishing,. 1980). Hogan also lists some pieces which he does not show. He says that ultimately International produced 101 different Vintage pieces, but does not explain how he counted them. In addition, John Kingston of Syracuse, N.Y., a silver dealer and longtime Vintage collector has allowed me to examine, measure and photograph his collection. In years of collecting, he has never- seen some of the pieces illustrated in the MacLachlan book. For more details about Vintage and other collectible silver patterns, check out Books about Silver and Silver Links. I inherited a set of Vintage from my grandmother. It is stamped Wm A Rogers A1 or I, followed by three shields each carrying the letter R. There is pie server with a mark I can’t read followed by Wm.Rogers follows by a star. Further down the handle are the initials IS. We aren’t interested in selling but would love to know about these pieces. The term “Vintage” is used in several different ways. It can simply mean old silver, probably made between 1890 and 1910, or it can be a grape pattern called Vintage. The pattern named Vintage always has some variation of the 1847 Rogers Bros. mark. Not all Rogers marks are from the same company. Wm A Rogers is a mark of Oneida and Wm Rogers is one of the International marks but not the same as 1847 Rogers Bros. I no longer do identifications. I suggest you contact a dealer who does and can recommend the service of Replacements Ltd. I have a spoon that I think is a grapefruit spoon, with a sharp point on the bowl. 1847 RogersBros, XS with the Meridian plaque. Is anyone interested? 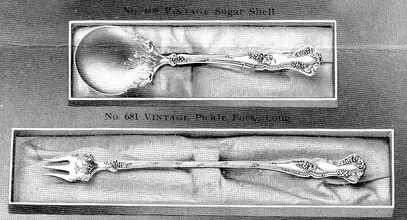 Iced teaspoons are scarce because they were introduced near the end of the period when Vintage was made. Your best bets are eBay and Replacements. They will be expensive. Just finished cleaning my grandmother’s pieces that were in my mother’s collection. They are grape patterns marked 1847 and are so beautiful will treasure forever. I just found you web site and it is interesting to read the history of these patterns. I am in the possession of several “La VIgne ” piece, 1 sugar spoon, 2 dinner spoons and 5 dinner forks. The XII is one of several marks used to denote quality. It has little meaning by itself. So far as I can learn, all the flatware marked 1847 Rogers Bros. was of the same high quality. It was International’s best line of flatware and they did everything they could to maintain its reputation. this mark XII represents weight in dwt of how much silver is on the piece not sure the date when they stopped using it . my guess is 1909 when they switch to XS. I find the alphabetical order pieces listed in somehow outdated, for example I do not see listed the salad serving with wooden inserts, hollow handle master butter knife or the Lettuce Fork or Spoon, also I do not see any information letting us know vintage was first manufactured with the MERIDEN B. COMPANY stamp only. International continued to use the Meriden mark for 1847 Rogers Bros patterns for some years and did not mark many items International. Their print advertising emphasized Meriden Brittania and which cited International in very small letters. The pdf list linked to my post is excerpted from my book and does not include all the details. The book shows two salad sets, one in the older style of large spoon plus large fork, and one in the newer style with wooden inserts into hollow handles. If I do not list a lettuce fork it is because I had not found solid evidence of one at the time I wrote the book (1995). I also do not include a mustard ladle, although some people say one exists. Edmund P. Hogan is usually considered the Vintage expert. His book, The Elegance of Old Silverplate shows catalog pages and gives a list. Both are incomplete. He does not include the iced tea spoon, the second salad set or, for that matter, a lettuce fork. I just found a box of silver that I believe is 1904 vintage – some are stamped quintuple. Did they do that too I’m addition to the xs? I also have the beautiful box with old grooved corners (like old drawers). One of the butter knives has the handle turned 180 degrees. Seems to be full set of 12 plus many interesting serving pieces. If the silver is marked 1847 Rogers Bros. and the design matches the pattern shown on my blog page, your silver is the Vintage pattern. Condition is important in establishing value, as collectors will usually not buy damaged flatware. The butter knife is called a twist-handled butter. It is designed that way to sit on the plate and often has decorations on the blade to make it more attractive. I have service for 12 pearl handled knives and forks…anyone know of spoons also. I take it that the pearl-handled pieces do not match the Vintage silverplate pattern. Pearl-handles, especially knives, were often used with a named pattern of silverplate. The forks are less common. I have seen serving spoons with pearl handles but not, to the best of my recollection, teaspoons or place spoons. That doesn’t mean they don’t exist, but they must be uncommon. I’m not sure what it means, possibly some sort of manufacturing code. Some people think such marks may be an indication of quality (see the question above) but so far as I know all silverplate within the 1847 Rogers Bros brand was of the same high quality. That was the purpose of the brand identification — to assure the customer of quality. You have found a wonderful pattern to collect. In the long run, it is better to pay more and look for very good to excellent condition in the pieces that you buy. The 28 piece lot I ended up with is composed of 4 knives, 12 salad forks, 6 dinner forks, three large table spoons, a gravy or soup ladle, and 2 service spoons. All except the knives have the word triple spelled out near the name. Could this mean triple plated or is this standard? Expressions like “triple plate” were mostly a marketing device, meant to impress the buyer. Quality varied from brand to brand, however. 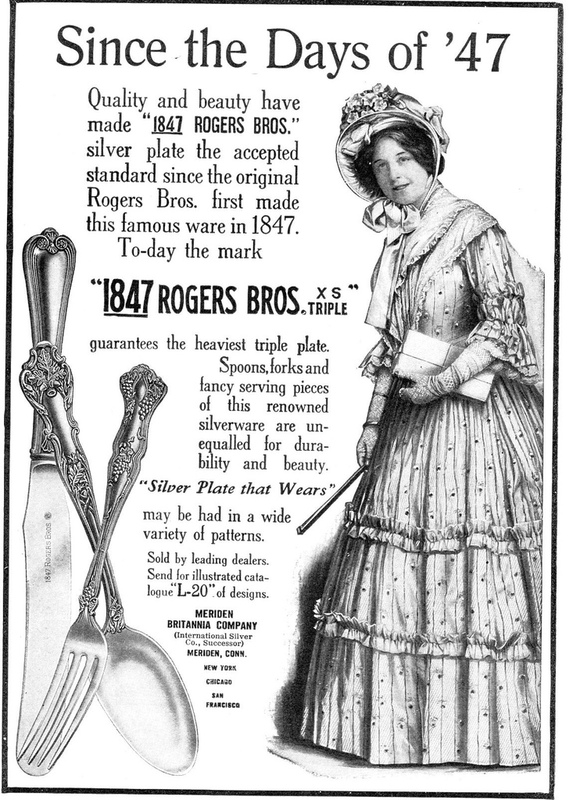 The 1847 Rogers Bros brand was top quality and would have been more heavily plated than Wm Rogers & Son or Rogers Mfg. I have a set of silver spoons that have the name Wm Rogers & Son AA on the back of the handles the date is 1881. Can anyone tell me about them or what they are worth? I no longer deal in silver and do not have current price information. You can find some help with identification in my post https://silverseason.wordpress.com/american-silverplate/learning/identifying-your-silver/, as well as some guidance about factors affecting values in https://silverseason.wordpress.com/american-silverplate/learning/what-is-my-silver-worth/. Hello, my friend has some grape patterned spoons. They are not the same as any photos on this site. They are marked on the back of the handle with “1881 rogers A1” The spoons have been used a great deal and are quite deeply scratched and worn however they do still have a lot of plate on them. The other thing is the bowls, they are angled. We are not sure if this is wear or if they were always like this. The angles are quite even on all 7 spoons. Can anyone tell me anything about them?